As a designer, you are the ‘artist’ for the client’s course. 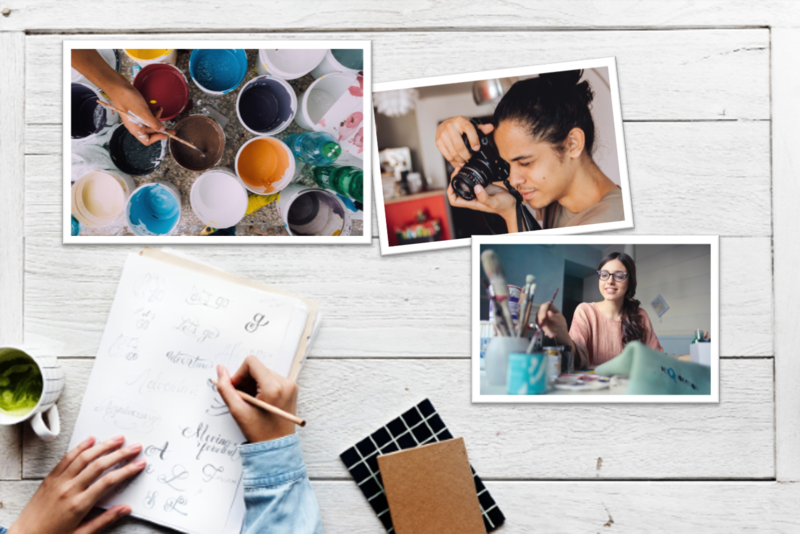 Whether you are creating a storyboard for a soft skills course or software application, it is important to 1) create a document for the course that easily tells a story with text and imagery. 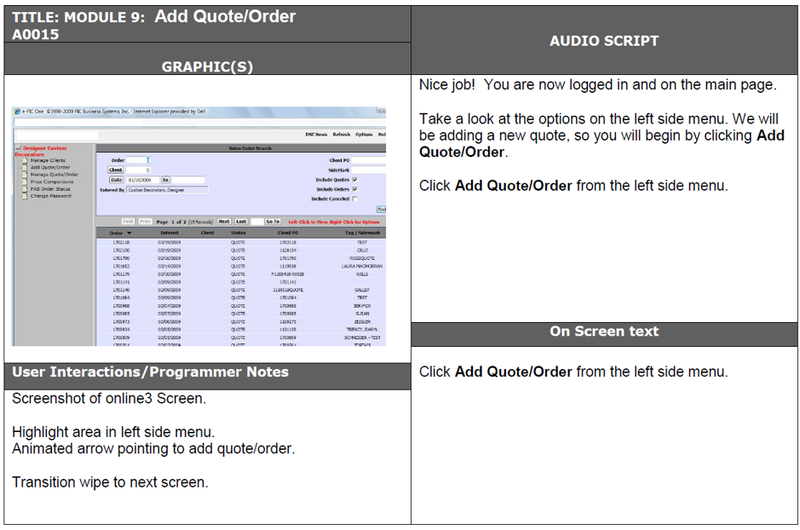 And 2) create a document that all project team members can work from. This includes voice talents, graphic designers, and developers. You also want to create a document in a tool that allows for Track Changes, such as MS Word. I have various templates I have created over the years using tables within MS Word. On page one, I ensure a log is maintained that describes the course, any custom client tracking or ID numbers, the main point of contact for the design, and who edited the document last. A sample is below. Topic/subtopic headers matching the outline from the Design Document. On-screen text for each slide. Brief description for each slide. 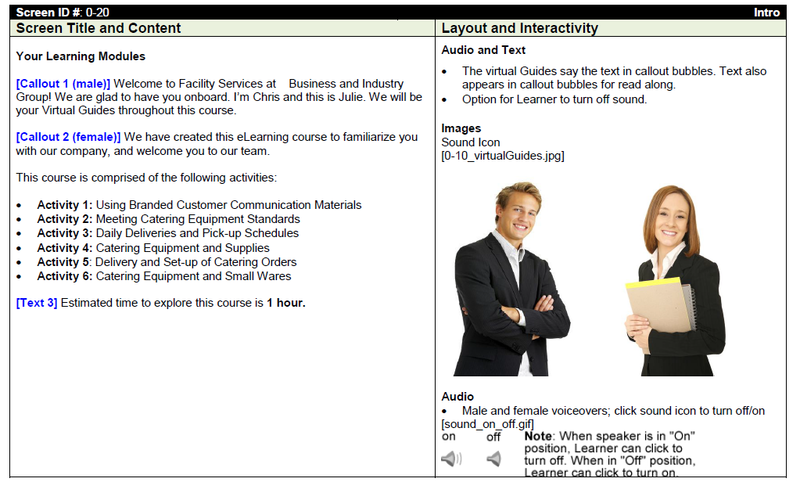 Audio narration text for each slide. Graphic image or descriptions depending on the Storyboard layout/template. Programmer instructions for interactions and activities, graphic descriptions, and/or animation cues. Assessment descriptions, questions, feedback and answers. 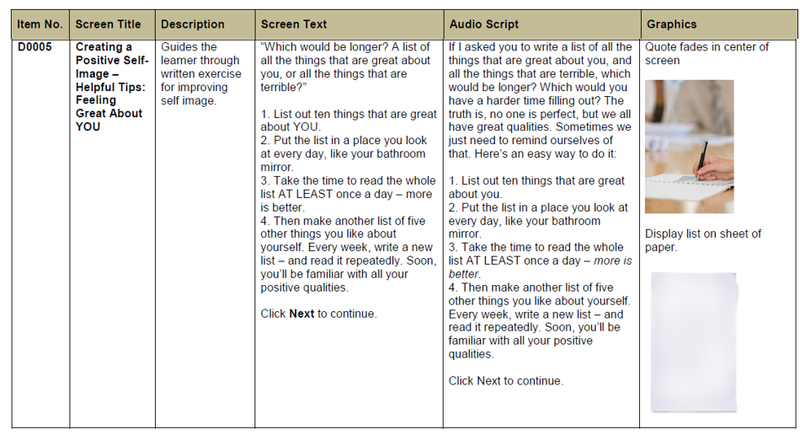 Here is a sample of what that would look like in a couple of different table layout formats. Once the client has included all of their track changes and you have provided the ‘agreed’ number of revisions to finalize the document, this document can be sent to voice talents, graphic designers, and developers to begin work! Each team member can use the storyboard slide-ID number for each slide, for example, the A0005 displayed below, as the filename for their audio and image files, which makes it super easy for the developer to implement into each slide. 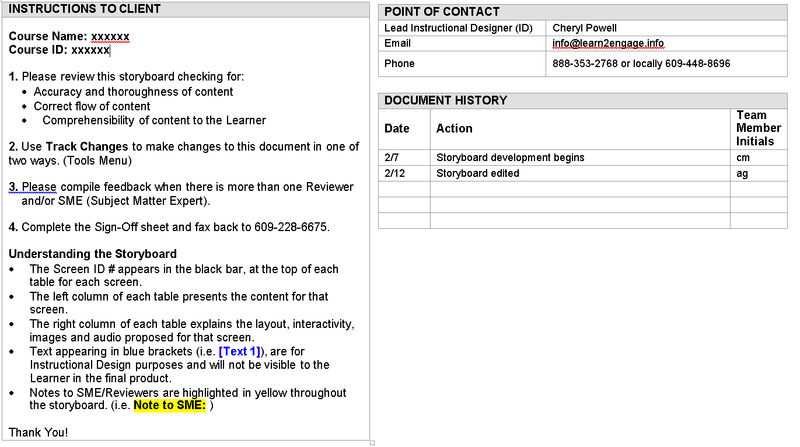 Hopefully this How To series on laying out an eLearning storyboard was helpful!